, your patience is about to pay off. Today, we're announcing the addition of Street View imagery in not one or two but six new cities! Now you can check out 360-degree views of Chicago, Pittsburgh, Philadelphia, Phoenix, Portland and Tucson. As an added bonus, the images in Phoenix, Tucson and parts of Chicago are all in high resolution. But wait! There's more. 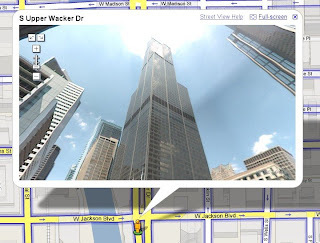 Ever wish you could pan up to the very top of a 50-story skyscraper using Street View? Well, prepare yourself for some serious sightseeing; we've introduced the ability to pan up in most new cities. For those of you who have been eagerly awaiting new cities to be added to Street View in Google Maps, your patience is about to pay off. Today, we're announcing the addition of Street View imagery in not one or two but six new cities!